You need to record healthy levels in the first place. If you don't, no amount of tweaking plug-ins will enable you to produce a good clean audiophile recording. No matter what you're using to record (a computer, a portable hard disk recorder, a 24-track analog deck), you're bound by two extremes: you can't record louder waveforms than the media can handle (that creates distortion), and you can't record waveforms that are quieter than the noise floor of the media (that means that the inherent hiss or quantization noise is louder than the music). This signal is clipped. There's distortion in it that you can hear, and it usually sounds pretty damn ugly. 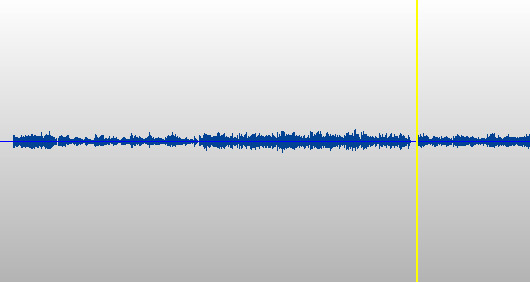 The nice rounded peaks of your waveform have turned into dead flat mesas. The edges of those mesas sound like fingernails on a blackboard. Two hours of such sounds can drive a person insane. Don't do it. Side note: if you're using virtual synths in your computer (like EZ Drummer), you should "print" all of these synths so that they're audio files, just like your guitars and vocals. That way, if you open the project two years later and the virtual synths are no longer working, you can still get at those tracks and do a remix or whatever else floats your boat. Otherwise, that part is gone forever. It's like losing the lead guitar track because you sold the strat you used to record it. Anyway, when making the audio files from those virtual synths, the same rules apply for the level of the resulting waveform. If it looks too quiet or too loud, go back and print it again after adjusting the instrument's volume knob. Another Side Note: Garageband seems to take whatever it is you record and automatically "normalize" it, which means it boosts it until it looks like a healthy signal, regardless of the recording level. This is not a good thing - it's the same as blowing up a tiny web graphic and printing it. The opposite is true as well - garageband will compress the signal to prevent it from distorting. But that compression is uncontrolled, and can sound pretty awful. So learn to set the input levels in garageband while you're recording - it's critical. *I'm taking it for granted that you're recording your signal "flat"- in other words, no equalization, no compression, and not "after" the mixer board's controls, which would color the signal. This is the way I record. I figure I can always tweak the sound after I've captured it.